This manuscript page, which measures 12 x 8 in (ca. 29 x 20 cm), was created in Peru, under the guidance of a Mercedarian friar. The painting depicts the Coya Rahua Oclla, a pre-Hispanic Inka queen. She stands upon an open hill, wearing signs of both indigenous and European royalty. An anachronistic European-style coat of arms hovers in an upper corner of the painting, her name in the other. This image of long-dead Inka queen reveals how images of pre-Hispanic royalty were re-worked after the Spanish conquest. 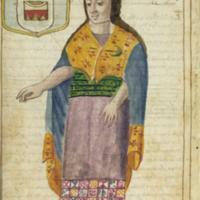 Coya Rahua Oclla appears wearing pre-Hispanic style robes, but her body has been rendered in a style introduced to Peru by Europeans. She is a figure from Inka antiquity who has been updated in form and style (if not also meaning). Her image is thus a fully colonial invention, crafted from visual and representational conventions which themselves had distinct, and quite different histories. The images in the General History of Peru, or Historia general del Piru,were probably created by a workshop of painters, one of whom was Felipe Guaman Poma de Ayala, an Andean man famous for his own 17th-century account and images of Perú, the New Chronicle and Good Government. Martín de Murua, who wrote the text of this manuscript and commissioned its images, was a Mercedarian friar, who worked in the Viceroyalty of Perú. 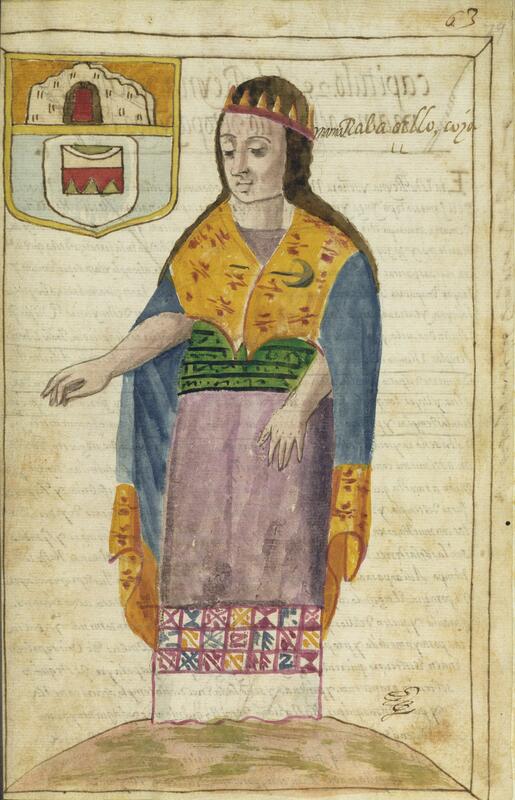 This is one of several manuscripts concerning the Andean past he created in the 17th century. The painting is one of 38 images in the larger manuscript, General History of Peru. It was created on European paper with watercolor paints. There are two versions of Murúa’s work. One seems to be a draft, and the other a final version intended for publication. This painting comes from the latter version, which is today known as the Wellington Manuscript, after a previous owner, the Duke of Wellington. It includes a handful of drawings pasted in from the earlier draft of Murúa’s history, presumably in the 17th century under Murúa’s supervision. This is one such drawing. Today the Wellington Manuscript is in the J. Paul Getty Museum in Los Angeles, California.